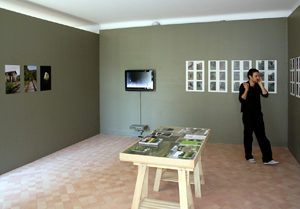 “WorldWatchers 3”, seven artists in residence at the “Maisons Daura” in Saint-Cirq Lapopie, Art Centre of Cajarc, Lot, France. 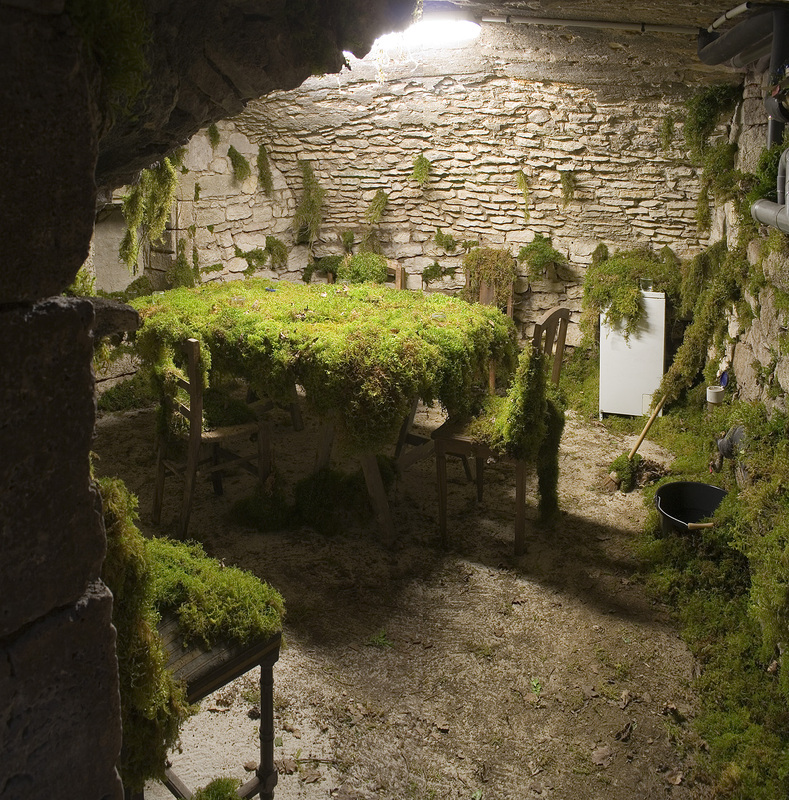 Gilles Bruni works in a field that one could call ' repairing the landscape'. Using a site and diverse materials he creates outdoor installations . He does this after working with the local population to 'reveal' the tensions and solutions surrounding an environmental problem. Here in the Lot valley his chosen site of interest is the disused railway track. 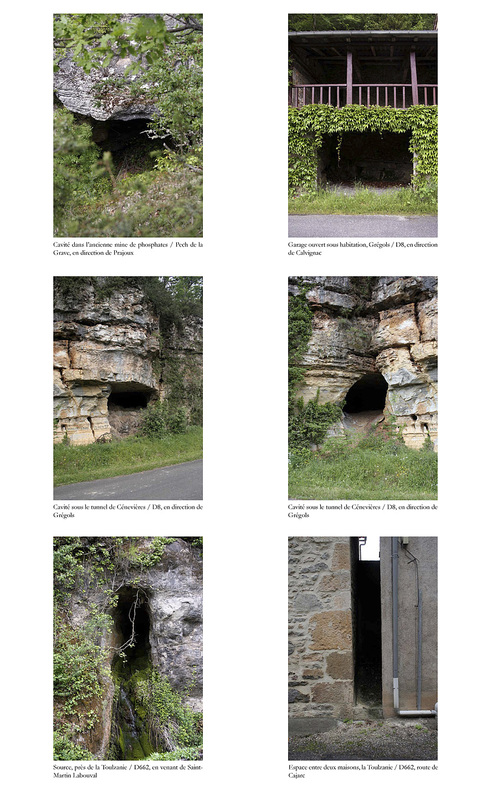 As a tripartite piece in three places: “Documentary” in the Art Centre of Cajarc, “At the end of the tunnel” in the village of Cénevières and “Grotesque” in the cellar of the main Daura’s house of Saint-Cirq-Lapopie. Photographic panel, 8 printed, video boards and 3 photographs. 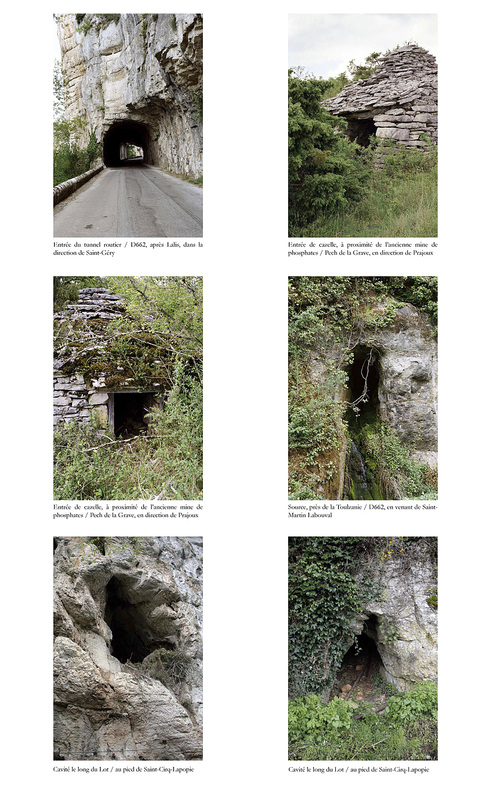 The artist presents a documentation of the research he carried out on the area prior to his installations in Saint-Cirq Lapopie and Cénevières. Railway entrance to the tunnel, Taken out from the village, between the graveyard of the village and home of the gate-keeper, D8, road of Calvignac. 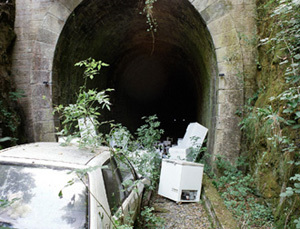 These landscaped installations are like ‘repairing’ critiques of the landscape: They explore and reveal the memory of the sites encountered, for example here the tunnel- a recurrent figure from the grotto – and the railway track, serve as a recollection of the recent yet forgotten economic activity of this part of the valley. wreck of small boat of the Lot, the four iron to horses / Movable: Wheels of landeau, 8 rims of car, cart with autocycle, motorbike, clippers with electrical turf employed, bulky. about 4,5 m of width x 2,5 m maxi of width x 102 m of length. Maurice and Jean - Marie, from the village; Laura and Jessie, Pauline and Rachel, Marion, helpers trainees of the Arts centre; the team of the "Abattoirs", museum of Toulouse. “Grotesque”,: cellar of the Maisons Daura. Not without a touch of humour, the artist has transformed the cellar of the residencies into a grotto that has been taken over by moss. The evocative sounds of water from the building are also accompanied by a specific sonorous work of Akira SUNRISE, which extends the experience. approx 3.5 m wide x 3.5 m long x 2.2 m high max. 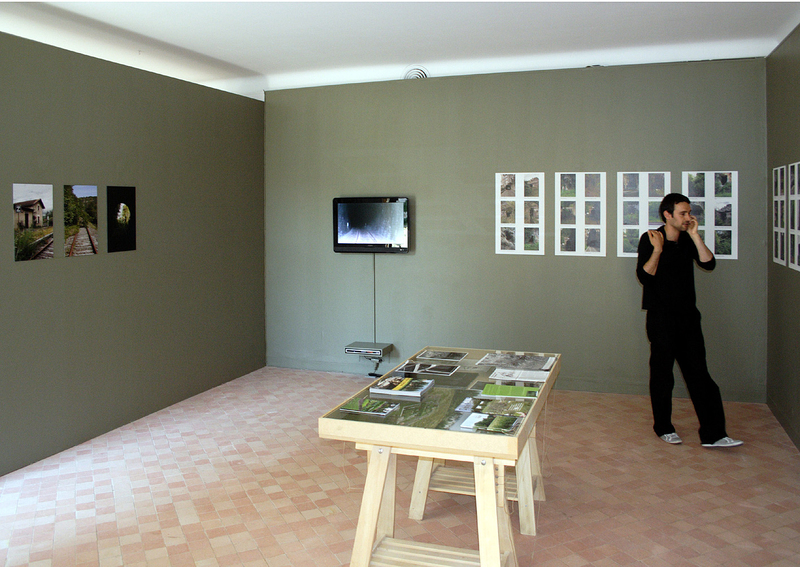 During my residence at the “Maisons Daura”, In the end I conceived of my work as a tripartite piece. The purpose of the “Documentary” is to introduce visitors to my approach, with hoardings showing pictures of “caves”, cavities and recesses, a panel on the three transport routes through the valley, etc. that together draw up a kind of “inventory” of the region. In Cénevières, I invite visitors to make their way to the railway tunnel dug out of the rock. With its gloomy, somewhat disturbing entrance that dives into the rock not far from the road and the river, the place reminds me of the deeply gouged valley of the Lot... It was there that I set up “Au bout du tunnel” – a route following the railway line along which are deposited various disused articles salvaged from the neighbourhood, from local people, from tips, or from recycling centres... 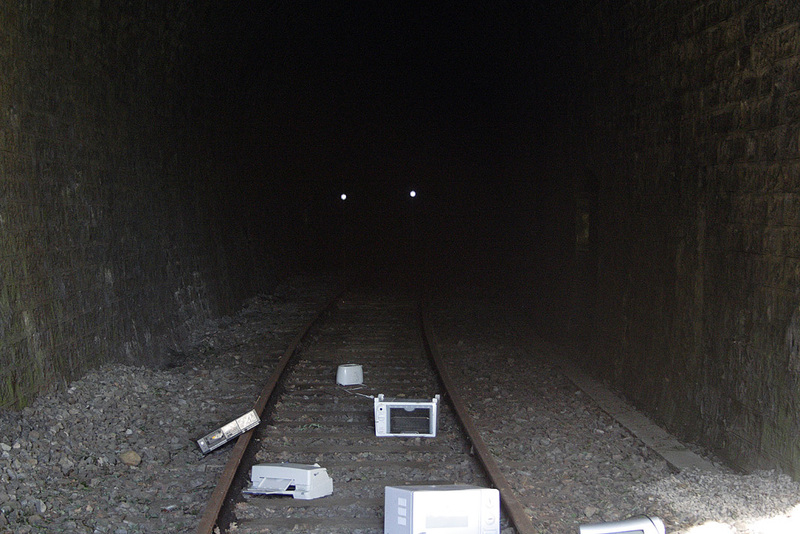 But the railway also represents a timeline parcelled out by significant elements; an itinerary that shifts in scale as one proceeds, and which, as one loses oneself in the darkness of the tunnel – a further metaphor for the cave – draws the eye to a chaos of objects. I stumbled across a location that reminded me of the local karst topography at once by its atmosphere and by its evocative sounds. The house itself becomes an aquifer system, with pipes of grey water crisscrossing another “cave”. The component of sound thus becoming determinant, I turned to artist Akira Sunrise for an idea for an audio piece. Pre-eminent here is the image of the plant, with, as we have already noted, its capacity to cover and erase all trace of human occupation – here exemplified by a few pieces of furniture. The cavity was lined with moss from areas in the locality it had invaded – trees, rocks... The result is not unlike the Renaissance art of the grotesque inspired by the discovery of buried houses in Ancient Rome.